65 cm from shoulder to bottom. Fitted style with zip on one side. This is a smooth type material not the stretchy type so I have listed size below as quite small fitting. looks great worn over jeans/trousers/skirts. Deep navy with cap sleeves. Ladies NEXT top size 14. Slight thick material, boxy style. Esprit Short Sleeve Blouse. Condition is Used. Dispatched with Royal Mail 1st Class. This is a gorgeous ladies satin blouse from ZARA. It is a lovely golden cream colour with very tiny blue polka dots. Pit to pit: 20". Pop over style. Feminine style with short cap sleeves. Machine washable. Excellent Fat Face blue floral top blouse size 14. Condition is Used. Dispatched with Royal Mail 2nd Class. Women’s navy top for sale by Gilly Hicks. It’s cap sleeved, square necked with tie detail front, sheer floral lacy panel detail and elasticated hem. It’s made with 100% cotton, is machine washable and a size large. It’s been worn previously but is still in very good condition. Comes from a smoke & pet free home, any questions please ask. Can combine postage on multiple items. 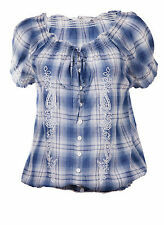 ladies next tops size 14. Condition is Used. Dispatched with Royal Mail 2nd Class Large Letter. Vibrant on trend Hawaiian bowling shirt button down short sleeve blouse from Monki with tigers. Very comfortable and flattering and soft. Selling as it’s too bright for me but absolutely love it! From a smoke-free pet-free home Sorry no returns Happy bidding! A lovely top from Monsoon. Size 10. Made from a striped, cotton fabric. V neckline. Shell button fastening with a drawstring. I have many other items for sale, please take a look. Long sleeve top from Mistral. Aqua green colour, more green than colour in photos. Dorothy Perkins blouse size 14. Lovely condition - hardly worn. Navy with pretty floral pattern. Buttoned detailing on the back. Non smoking household and freshly laundered. Dispatched with Royal Mail 2nd Class. Womens Blouse, Navy Blue, Size 8, Short Cap Sleeve. Chiffon button up blouse with bow detail at nexk. Navy blue with red & white pattern. Excellent used condition. Dispatched with Royal Mail 2nd Class. Suit skirt and jacket also available - check out my other items! Combined postage available. Thanks for looking. River Island Cropped Blouse Size M. With button front fastening and front waist tie. Fabric is non crease in a pale peachy colour with vintage cars print. It has capped sleeves that have a turn up. Condition is Used and showing little to no signs of wear. Labels have been cut so sizing is an estimate. Dispatched with Royal Mail 2nd Class. Long top from Yours size 24 in blue with daisy pattern. Condition is Used. Dispatched with Royal Mail 2nd Class. Monsoon Blue Cotton Button Up Cap Sleeve Polka Dots Blouse Shirt Top 14. Condition is Used. Dispatched with Royal Mail 2nd Class. Flutter Sleeve. Most parcels are sent 1. Can be worn both ways.stripes or text font. Dorothy Perkins Petites Navy Lace Top 6. Dispatched with Royal Mail 2nd Class. SIZE 10 BNWT. FLOWER PRINT WRAP BLOUSE. FASHION UNION. MATERIAL POLYESTER. LOVELY TOP IN NAVY /REDS AND CORAL PINK. SIZE 12 UK. SHOWN ON A STANDARD SIZE 10 UK MANNEQUIN. 17" ( LENGTH FROM ARMPIT TO HEM ). PERFECT FOR ANY OCCASION - WORK, PARTY ETC. Long Tall Sally Size 12 Royal Blue Blouse cup Sleeve . Unworn. Cotton material See description for more details. From a pet free clean home. See my other items, happy to combine postage. Any questions please ask. 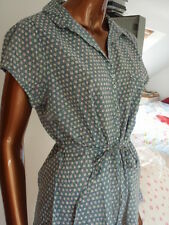 Very pretty COMPTOIR DES COTONNIERS size 10 (38) soft viscose crepe Turquoise Tunic top. Mandarin collar. V neckline. Frill cap sleeves. pre worn, very good condition. a lovely top in a stunning colour. Floaty Thin Top. Marks & Spencer. material sheer. Blue Floral. Cap Sleeve.